We specialize in homeowner repairs and new installation. Call Now 401-447-4264 . 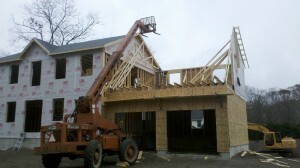 We are the Best Roofing Contractors and Siding Contractors. We are ready to fix your roof. Let P. Ialongo Building Company do a Twelve Point Inspection. Go to our 12 point inspection page and let us help you through this process. P. Ialongo Building Co. is a well established Rhode island Roofing Contractor and does not use subcontractors. We have been in business for so many years because of our high level of standards. Our company is known for providing quality work and standing behind that. We use only quality products that offer warranties. Quality Roofing Products such as timberline shingles All of my materials are bought through quaility lumber yards. United Builders Supply carries quility shingles, siding, windows, doors, lumber and much more. We can cover all your Rhode Island roofing needs such: roof replacement, roof repair, new roof installs, replace sheathing, flashing repair, chimney flashing repair, and much more. We provide free estimates with all the roofing services listed above. The roof over your head is literally your first defense against the outside elements. If your roof is in need of a roof replacement you are at risk for serious damage to your whole house and all your belongings. Water can seep in, damaging the structure of the roof, walls and ceilings. Left in disrepair the cost of having the damage repaired will only grow over time. The sooner you call a competent Roofing Contractor to take care of the problem, the more money you will actually save. No matter what type of roof you have, replacing it can be a major expense. You want to hire a company that has a proven track record. You don’t want to hire a company that cuts corners, they won’t be around when you need them. Roofing is a profession requiring many skills including framing construction, mathematics and carpentry. Finding a Roofing Contractor is the easy part. Finding a qualified Rhode Island Roofing Company that has the experience and know-how to do the job right and leave you with a secure roof over your head might take some time. Once you have a few companies in mind, it’s time to ask for some bids. Ask for a bid from each Roofing Contractor you feel comfortable with. Some people say the more bids the better but this is not necessarily true. If a Roofing Contractor feels there is too much competition he may simply walk away. The truth is my Rhode Island Roofing – Siding Company will match up or beat the competition. I pride myself in giving honest estimates and doing quaility work. so call now and deal with the best. Don’t forget that you want more than just a piece of paper with a total figure. You need to see a detailed estimate of what the job will entail and all costs for materials and labor. Provide each Rhode Island Roofing Contractor gives a detailed list of what you’d like included in the bids and this will help ensure that you receive some uniform quotes that are easy to compare. If you find that one bid is considerably lower than the rest, it will also be easier to pick out the differences. The lowest bid is not always the best deal nor is the highest bid going to guarantee you’ll get the best roofing service or materials. You want a good combination of price and service. If one bid seems considerably lower than the others ask the Roofing Contractor why. A Roofing Contractor may simply have lower overhead, fewer workers or a better source for materials and this savings can often be passed on to the customer but make certain the Rhode Island Roofing Contractor can back up any claims he makes. Once you’ve found the best Roofing Contractor Or Siding Company you feel is right for the job, you’ll need to work up a contract.